The Conservation Foundation has been hosting the Beyond the Basics Conference since 2008. As the name implies we seek out presentations that go Beyond the Basic information about what Best Management Practices (BMPs) are and why they are good. We ask presenters to provide in-depth information about how the BMPs work, where they are best used, how can they be used with other BMPs and equally important, what can go wrong, and where they do NOT work. 1. To move the stormwater discussion out of the engineering office. Stormwater management is a complex issue and requires a multi-disciplinary approach with staff from engineering, planning, public works and elected officials. 2. To elevate the importance of long-term, funded maintenance of stormwater BMPs to the overall success of stormwater management programs. 3. To showcase the great talent and expertise we have in our region. We can make effective and cost efficient stormwater management a reality here in northeastern Illinois. 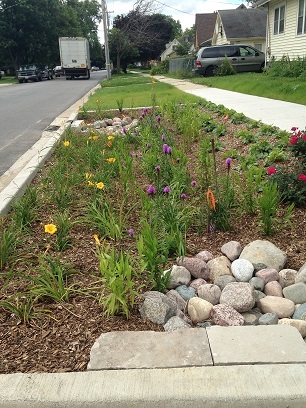 Cleaner stormwater benefits everyone! Beyond the Basics is held every other year in September. A keynote address kicks off the day and then participants can choose from three concurrent tracks with four sessions each for a minimum of 15 presentation options throughout the day. 117 participants took advantage of the professional development hours and continuing education credits for the Illinois Floodplain Managers Association certification. Over 20 exhibitors for related services and products. This is THE Stormwater Management Conference in northern Illinois to attend and to support through sponsorships or exhibit space. This is a great place to get in front of your target audience for stormwater related services and products. Please contact Scott LaMorte on staff with any questions or if you are interested in sponsoring this great event. The sooner you sponsor the greater the value in advertising hits. Call 630-428-4500, Ext. 142 or email him. Click here to download presentations from Beyond the Basics 2014.